WHIPPANY, NJ—(Marketwired – Dec 4, 2014) – The holidays are undoubtedly the busiest time of year, especially in Morris County, New Jersey. With its period reenactments, holiday concerts and sweet attractions, this destination could turn even Scrooge into the merriest of elves. And the Hanover Marriott is helping to spread the Christmas cheer with a 20–percent discount on its accommodations located in the center of it all. 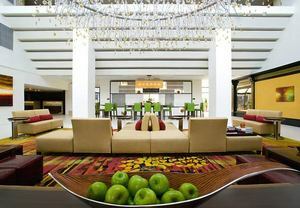 Guests arriving at this stylish option among hotels in Morristown, NJ have their pick of events to attend. The season unofficially kicks off with the Christmas Festival at the Morristown Green on November 30, where highlights include Santa's arrival and the lighting of the Green. And strolling through Historic Chester offers quintessential Christmas experiences, too. Visitors can admire decorated shop windows, listen to Dickensian carolers and even take a carriage ride. Other exciting events include the Santa Claus Special at the Whippany Railway Museum, where guests can chat with Santa during a 45–minute train ride in Morristown's version of “The Polar Express.” Or visitors can travel back in time to see a Civil War Christmas reenactment at Historic Speedwell. Of course, no Christmas season is complete without attending a holiday concert, and Stone Soup Symphony's complimentary performances at local venues are easily accessible from this Whippany, NJ hotel's location. And the Gingerbread Wonderland at Frelinghuysen Arboretum, where amateur bakers show off their mouthwatering gingerbread real estate, promises to add a sweet note to any vacation. However visitors choose to mark the holidays, everyone can agree the best place to stay among East Hanover, NJ hotels is the Hanover Marriott. Spacious guest rooms afford luxurious touches to revive visitors in between attractions (think stylish decor, soft bedding and spa–like Thann bath amenities). And the two restaurants are as delicious as they are one–of–a–kind, whether it's breakfast at Seeds, or a lunch or dinner at the imported Irish pub, The Auld Shebeen. Best of all, however, guests can enjoy all the comforts of this hotel in East Hanover for less when they book a three–day weekend. Available through December 31, 2014, the promotion features rates starting at $95 per night for pre–paid stays over a Friday or Saturday evening. Between the accommodations, the attractions and the savings, guests just might start believing in Santa Claus again. To secure the package rate, travelers may use the promotional code B72 when making reservations online or by phone at 1–800–228–9290. 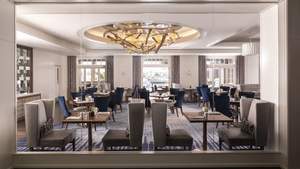 Located near the Parsippany, Hanover and Whippany areas, the Hanover Marriott combines its convenient location with contemporary luxury. Its 353 guest rooms and suites pamper visitors with down duvets, mattress toppers, granite countertops in the bathrooms and high–speed Internet access. And the rest of the property is just as inviting. The 18,850 square feet of meeting space translates to stunning events, conferences and weddings, while amenities like the indoor and outdoor swimming pools and state–of–the–art fitness center let guests keep up with their fitness routines while traveling. Dining takes an unexpected turn in The Auld Shebeen Pub, which was built in Ireland and reassembled stateside for a genuine pub experience. Seeds, on the other hand, embraces a contemporary attitude with its sleek décor and daily breakfast service. The restaurants, like the hotel, offer guests the best of many worlds. MARINA DEL REY, CA—(Marketwired – Dec 4, 2014) – The signature restaurant at The Ritz–Carlton, Marina del Rey, Cast & Plow, will be launching its first collection of holiday menus that will showcase Executive Chef Umit Kaygusuz's favorite winter dishes. Cast & Plow diners have the opportunity to choose between four seating times for Christmas Eve Dinner, Christmas Day Brunch or Christmas Day Dinner. Each menu is crafted to entice every palate with appetizers such as the farro risotto with lump crab, butternut soup with Point Reyes blue cheese, roasted duck breast and a variety of fresh winter salads. The restaurants main courses include selections such as pumpkin ravioli, honey glazed local ham, local bass and beef pot roast. Delicate desserts include an eggnog crème brûlée, vanilla bean cheesecake, a warm gingerbread bread pudding topped with sweet cream ice cream and a mini pie trio of pumpkin, cherry and pecan filling. Reservations at Cast & Plow are strongly suggested for each menu seating. You may call the restaurant reservation coordinator to make reservations at 310–574–4273. Minutes from LAX, Venice Beach, Santa Monica and Beverly Hills, The Ritz–Carlton, Marina del Rey offers a peaceful retreat that draws on the soothing elements of the surrounding ocean. Guests can admire the exceptional scenery from each of the 304 guest rooms and suites, featuring private balconies; the farm–to–table restaurant, highlighting locally sourced ingredients; LA's only waterfront pool or the luxury spa. As one of the city's only AAA Five Diamond hotels to have a waterfront location, The Ritz–Carlton, Marina del Rey offers a desirable venue for weddings and events, with more than 30,000 square feet of indoor and outdoor function space. Whether visitors are seeking a few days of self–reflection, a relaxing beach weekend, an unforgettable wedding venue or a quintessential California dining experience, The Ritz–Carlton, Marina del Rey offers the perfect destination. NEW YORK, NY—(Marketwired – Dec 4, 2014) – PALAZZO (www.palazzonyc.com), a boutique investment bank serving marketing services, interactive, information, and new media companies, today announced it has represented The Swift Collective, Inc. (“Swift”) in its sale to WPP's wholly–owned company, POSSIBLE, the global creative digital agency that is part of WPP Digital. The terms of the deal were not disclosed. Swift is a digital agency that specializes in creative and strategy, branded content creation and social media. Swift, based in Portland, OR, employs over 70 people and represents clients including HTC Corporation, Starbucks, Nestle, and REI. Shane Atchison, Global CEO of POSSIBLE and Swift founders, Liz Valentine and Alicia McVey have been friends for over 10 years and their agencies have competed for client work on more than one occasion. Their camaraderie is founded on a respect for each other's excellence in digital and Atchison's mentorship through Swift's rapid growth. Swift was recently recognized as “Small Agency of the Year, Northwest” by Advertising Age, which speaks to the power of their strategic and creative output, as well as their ability to deliver excellent results for clients. PALAZZO is a boutique investment bank with a singular focus on creating value and wealth for owners and stakeholders of marketing services, interactive, digital, information, and new media companies. PALAZZO's suite of advisory and acquisition services, combined with our ability to deliver superior results, makes us the partner of choice for companies intent on improving performance, or considering an M&A transaction. Born in 2007, Swift serves global Fortune 500 clients including Starbucks, HTC, and Nestle. With a seamless combination of planning, strategy, design, development and content creation, the Portland–based digital and content creation agency unleashes brand stories “at the speed of life” with the ultimate goal of exceeding client expectations. LYNNWOOD, WA—(Marketwired – Dec 4, 2014) – Zumiez Inc. (NASDAQ: ZUMZ), a leading specialty retailer of action sports related apparel, footwear, equipment and accessories, today reported results for the third quarter ended November 1, 2014. Total net sales for the third quarter ended November 1, 2014 (13 weeks) increased 11.6% to $213.3 million from $191.1 million in the quarter ended November 2, 2013 (13 weeks). Comparable sales for the thirteen weeks ended November 1, 2014 increased 3.7% on top of a comparable sales increase of 1.5% for the thirteen weeks ended November 2, 2013. Net income in the third quarter of fiscal 2014 increased 32.6% to $15.7 million, or $0.54 per diluted share, compared to net income of $11.9 million, or $0.39 per diluted share, in the third quarter of the prior fiscal year. The results for fiscal 2014 include costs of approximately $0.6 million, or $0.02 per diluted share, for charges associated with the acquisition of Blue Tomato, and the results for fiscal 2013 include costs of $1.7 million for charges associated with the acquisition of Blue Tomato and $1.3 million for the conditional settlement of a previously disclosed California class action wage and hour lawsuit, or $0.07 per diluted share in total. Total net sales for the nine months (39 weeks) ended November 1, 2014 increased 11.2% to $553.0 million from $497.5 million reported for the nine months (39 weeks) ended November 2, 2013. Comparable sales increased 3.0% for the thirty nine weeks ended November 1, 2014 on top of a comparable sales increase of 0.7% for the thirty nine weeks ended November 2, 2013. Net income in the first nine months of fiscal 2014 increased 34.5% to $25.7 million, or $0.88 per diluted share, compared to net income for the first nine months of the prior fiscal year of $19.1 million, or $0.63 per diluted share. Results for the first nine months of fiscal 2014 include approximately $1.9 million, or $0.05 per diluted share, for charges associated with the acquisition of Blue Tomato. Results for the first nine months of fiscal 2013 include approximately $6.3 million, or $0.16 per diluted share, for charges associated with the acquisition of Blue Tomato and the conditional settlement of a California class action wage and hour lawsuit. At November 1, 2014, the Company had cash and current marketable securities of $108.7 million compared to cash and current marketable securities of $94.2 million at November 2, 2013. The increase in cash and current marketable securities is a result of cash generated through operations, partially offset by capital expenditures and stock repurchases. Total net sales for the four–week period ended November 29, 2014 increased 12.6% to $70.3 million, compared to $62.4 million for the four–week period ended November 30, 2013. The Company's comparable sales increased 6.3% for the four–week period ended November 29, 2014 on top of a comparable sales increase of 1.7% for the four–week period ended November 30, 2013. The Company is introducing guidance for the three months ending January 31, 2015. Net sales are projected to be in the range $249 to $251 million resulting in net income per diluted share of approximately $0.69 to $0.72, which includes an estimated $0.6 million, or approximately $0.02 per diluted share, for charges associated with the acquisition of Blue Tomato. This guidance is based on an anticipated comparable sales increase in the 3% to 4% range for the fourth quarter of fiscal 2014. The Company currently intends to open 56 new stores in fiscal 2014, including 7 stores in Canada and 6 stores in Europe. A conference call will be held today to discuss third quarter fiscal 2014 results and will be webcast at 5:00 p.m. ET on http://ir.zumiez.com. Participants may also dial (857) 244–7312 followed by the conference identification code of 49051764. Zumiez is a leading multi–channel specialty retailer of action sports related apparel, footwear, equipment and accessories, focusing on skateboarding, snowboarding, surfing, motocross and BMX for young men and women. As of November 29, 2014 we operated 604 stores, included 552 in the United States, 35 in Canada, and 17 in Europe. We operate under the name Zumiez and Blue Tomato. Additionally, we operate ecommerce web sites at www.zumiez.com and www.blue–tomato.com. Certain statements in this press release and oral statements relating thereto made from time to time by representatives of the Company may constitute forward–looking statements for purposes of the safe harbor provisions under the Private Securities Litigation Reform Act of 1995. These statements include, without limitation, predictions and guidance relating to the Company's future financial performance, brand and product category diversity, ability to adjust product mix, integration of acquired businesses, growing customer demand for our products and new store openings. In some cases, you can identify forward–looking statements by terminology such as, “may,” “should,” “expects,” “plans,” “anticipates,” “believes,” “estimates,” “predicts,” “potential,” “continue,” or the negative of these terms or other comparable terminology. These forward–looking statements are based on management's current expectations but they involve a number of risks and uncertainties. Actual results and the timing of events could differ materially from those anticipated in the forward–looking statements as a result of risks and uncertainties, which include, without limitation, those described in the Company's quarterly report on Form 10–Q for the quarter ended August 2, 2014 as filed with the Securities and Exchange Commission and available at www.sec.gov. You are urged to consider these factors carefully in evaluating the forward–looking statements herein and are cautioned not to place undue reliance on such forward–looking statements, which are qualified in their entirety by this cautionary statement. The forward–looking statements speak only as of the date on which they are made and the Company undertakes no obligation to publicly update such forward–looking statements to reflect subsequent events or circumstances. NEW YORK, NY—(Marketwired – Dec 4, 2014) – Solar Senior Capital Ltd. (the “Company”)(NASDAQ: SUNS), today declared a distribution of $0.1175 per share for the month of December 2014. The distribution is payable on January 5, 2015 to stockholders of record as of December 18, 2014. The specific tax characteristics of the distribution will be reported to stockholders on Form 1099 after the end of the calendar year. Solar Senior Capital Ltd. is a closed–end investment company that has elected to be treated as a business development company under the Investment Company Act of 1940. The Company invests primarily in leveraged, middle market companies in the form of senior secured loans including first lien and second lien debt instruments. Statements included herein may constitute “forward–looking statements,” which relate to future events or our future performance or financial condition. These statements are not guarantees of future performance, condition or results and involve a number of risks and uncertainties. Actual results may differ materially from those in the forward–looking statements as a result of a number of factors, including those described from time to time in our filings with the Securities and Exchange Commission. Solar Senior Capital Ltd. undertakes no duty to update any forward–looking statements made herein. CHARLOTTE, NC—(Marketwired – Dec 4, 2014) – Pensmore Software, the industry–leading provider of integrated payment processing for Quickbooks® products, announced today that they now support American Express (AMEX) One Point. This new feature will allow for consolidated billing for all of Pensmore's clients and may lower the overall merchant cost to accept this card type. In addition, AMEX One Point simplifies the merchant card acceptance experience by consolidating reporting of card types into one report. As a company, Pensmore prides itself on providing solutions to merchants that save them both time and money. AMEX One Point is a feature that will strengthen this value proposition for Pensmore and provide clients with next day funding on all card types. Furthermore, support of AMEX One Point means clients will receive all activity for all card types in one monthly statement, eliminating the extra statement fee previously charged by American Express. Business owners interested in learning more about Pensmore, their services, and their support of AMEX One Point can request a free quote and overall assessment by visiting Pensmoresoftware.com. Pensmore Software is headquartered in Charlotte, NC and has offices in Denver, CO, Las Vegas, NV and Durango, CO. The company builds software for processing credit, debit and other forms of electronic payments, especially for businesses using QuickBooks® Point of Sale and QuickBooks® accounting software. With Lightning Payments™ for QuickBooks®, POS and their new iOS Application Intelligent Pay Link (ipLink) continues to be the market leader for integrated QuickBooks payment technology products. PETALUMA, CA—(Marketwired – Dec 4, 2014) – The Office of the Solicitor General has intervened in a Freedom of Information Act (FOIA) case between American Small Business League (ASBL) President Lloyd Chapman and the Pentagon. Federal District Court Judge William Alsup ordered the Pentagon to release data submitted by Sikorsky Aviation Corporation under the Pentagon's 25–year–old Comprehensive Subcontracting Plan Test Program to the ASBL by December 3. Judge Alsup has now granted a 60–day stay of the release of the data to give the Office of the Solicitor General time to decide if they want to appeal Judge Alsup's ruling. The ASBL selected Sikorsky at random as a test case to challenge the Pentagon's refusal to release any data on the CSPTP since it began in 1990. The CSPTP was adopted by the Pentagon under the pretest of “increasing subcontracting opportunities for small businesses.” All available information indicates the program did just the opposite. For twenty–five years the CSPTP has eliminated all data that had been previously available to the general public that could be used to track a prime contractors' compliance with federally mandated small business subcontracting goals. The CSPTP also eliminated all penalties prime contractors had previously faced, such as liquidated damages, for failing to comply with their small business subcontracting goals. A 2004 GAO investigation and language in the Chairman's Mark of the 2015 National Defense Authorization Act (NDAA) acknowledged there is no evidence in the program's twenty–five year history that is has ever benefited small businesses. A victory for the ASBL in the Sikorsky case will lead to the release of all the data submitted to the CSPTP. Chapman believes the data will prove the Pentagon has falsified the agencies compliance with federal law that mandates a minimum of 23 percent of all federal contracts be awarded to small businesses. Current participants in the CSPTP include: Boeing, BAE Systems, GE Aviation, General Dynamics, Hamilton Sundstrand Corporation, Harris Corporation, L3 Communications, Lockheed Martin, Northrop Grumman, Pratt & Whitney, Raytheon and Sikorsky. The Pentagon now has until January 22, 2015 to turn over the Sikorsky data to the ASBL. IVINS, UT—(Marketwired – Dec 4, 2014) – DeCaro Luxury Real Estate Auctions has announced an absolute auction on December 13, 2014 for 1500 East Split Rock #118, a 9,061–square–foot home in The Reserve at Entrada Snow Canyon, an exclusive gated community in the St. George area of Utah. The four–bedroom, five–and–a–half–bathroom luxury estate has unobstructed views of Snow Canyon State Park and borders the Red Cliffs Desert Tortoise Preserve. The entrance of 1500 East Split Rock #118 is marked by a striking cast–iron and glass cathedral door, which opens to a huge rounded foyer with 20–foot ceilings. The custom–built estate was completed in 2006 by Split Rock Fine Homes, a full–service construction company known for creating the finest communities and luxury homes in the St. George area. The four–bedroom five–and–a–half–bathroom home has several living, dining and entertainment areas, including a large family room with a curved window wall that features uncompromised views of Snow Canyon State Park. The estate also has a billiards room with a built–in entertainment system; a state–of–the–art screening room with theater–style seating, a high–top table and a wet bar; a spa with a dry sauna; a home office and a fully–equipped exercise room. The home's owner's suite is located on the first floor and features a gas fire place; a separate sitting room with three window walls; a closet room with a built–in washer and dryer; and an ensuite bathroom with his and hers vanity sinks and a oversized soaking tub. The home's gourmet kitchen also features oversized glass windows that offer panoramic views of the surrounding mountain range, as well as stainless steel double ovens, two sinks, and granite countertops. An island with a six–burner gas stove, additional counter space and bar seating for six is situated in the center of the room. An over–sized walk–in pantry is located adjacent to the kitchen and offers additional storage, built–in closets and a sink. Retractable glass walls off the kitchen lead to the estate's large outdoor patio, which as a seating area, a built–in stainless steel grill and a fire pit. The backyard also features a custom–built, heated in–ground pool with a waterslide and a natural–stone cave. A hot tub additionally overlooks the pool from an elevated area and offers unobstructed views of the surrounding property. The estate also has a four–car parking garage and .74–acres of gated land. 1500 East Split Rock #118 is located in an exclusive section of Entrada Snow Canyon Estates, known as The Reserve. All residents of The Reserve are members of the Entrada Country Club, which is home to an award–winning Johnny Miller Signature Design golf course that encompasses 710 acres of desert land and is currently ranked as Utah's top year–round private golf course. Members also have access to The Sports & Fitness Center, which offers 13,000 square feet of fitness equipment, spa services, indoor and outdoor pools, tennis courts, outdoor basketball courts and a sand volleyball court. This home is located near the major hub of the Grand Circle which contains America's largest concentration of national parks and monuments, including the Grand Canyon, Zion National Park, Lake Powell and Snow Canyon State Park. The property is open for prospective buyers to view on Saturdays and Sundays, from 1:00 p.m. to 4:00 p.m. beginning Saturday, November 22, 2014. The last scheduled open house will be held the day before the auction on Friday, December 12, 2014 from 1:00 p.m. to 4:00 p.m. The estate may also be shown by private appointment by contacting DeCaro Luxury Real Estate Auctions. The absolute auction of this private estate will be held onsite at 1500 East Split Rock #118, Ivins, Utah on Saturday, December 13 at 11:00 a.m. Broker participation is invited. For additional information on this auction, as well as other DeCaro auctions please, call 1.800.332.3767 or visit www.DeCaroAuctions.com. About DeCaro Luxury Real Estate Auctions: Founded by Daniel DeCaro, a licensed real estate broker and luxury property auctioneer, DeCaro Luxury Real Estate Auctions has been auctioning luxury properties of distinction for more than 35 years. DeCaro has settled billions of dollars in luxury assets, executing flawless nationwide live auctions. DeCaro is the foremost leader and innovator in the field of auctioning luxury estates, yachts, and aircraft. For more information call 1.800.332.3767. ROSELAND, NJ—(Marketwired – Dec 4, 2014) – ADP®, a leading global provider of Human Capital Management (HCM) solutions, today announced their participation in the 2014 HACR Corporate Inclusion Index (HACR CII). The CII is a research initiative conducted by the Hispanic Association on Corporate Responsibility (HACR) and the HACR Research Institute. Participation in the survey helps track trends in Corporate America to measure diversity and Hispanic inclusion at Fortune 100 companies and HACR Corporate Member companies. The 2014 HACR CII report focuses on the progress that participants have made over the last year as well as the progress for Hispanics more generally in Corporate America. A total of 129 corporations received invitations to take part in the survey and 61 companies submitted surveys. Total participants increased for the 6th consecutive year. Over 90 percent of the 2013 participants returned in 2014 and HACR welcomed 4 new corporate participants this year. These participation rates reflect Corporate America's commitment to diversity and Hispanic inclusion. The survey focuses on four areas: Employment, Procurement, Philanthropy and Governance. With this vital research, HACR and other organizations will be better equipped to analyze diversity in Corporate America, and plan for future generations of Americans. Employers around the world rely on ADP® (NASDAQ: ADP) for cloud–based solutions and services to help manage their most important asset — their people. From human resources and payroll to talent management to benefits administration, ADP brings unmatched depth and expertise in helping clients build a better workforce. A pioneer in Human Capital Management (HCM) and business process outsourcing, ADP serves more than 610,000 clients in 100 countries. ADP.com. The ADP logo and ADP are registered trademarks of ADP, LLC. All other marks are the property of their respective owners. Copyright © 2014 ADP, LLC.